These Air Vent Vacuum Relief Valves with the protected outlet have a special collar added below the cap which deters insects from entering and making themselves at home under the mushroom style cap. For additional information see Air/Vacuum Vents in our Education Center. Air/Vacuum Relief Valves deliver optimum performance and increased efficiency of an irrigation system by preventing air-lock problems and back suctioning of debris into the lines. The Air/Vacuum Relief Valve allows air to escape during the system’s initial start and until the pipe or drip lines are full of water. It also allows air to enter back into the system when the zone is turned off. The Air/Vacuum Relief Valve helps prevent clogging in sub-surface drip irrigation systems resulting from back suction of debris under vacuum conditions. 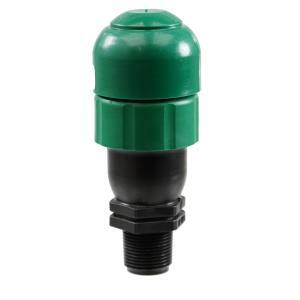 Install the Air Vacuum Relief Valve at the highest point of a drip line installation. Install the Air Vacuum Relief Valve after the drip zone, along the drip line laterals and at the highest point in the drip system layout. Install one Air Vacuum Relief Valve per zone or per each 10 GPM.